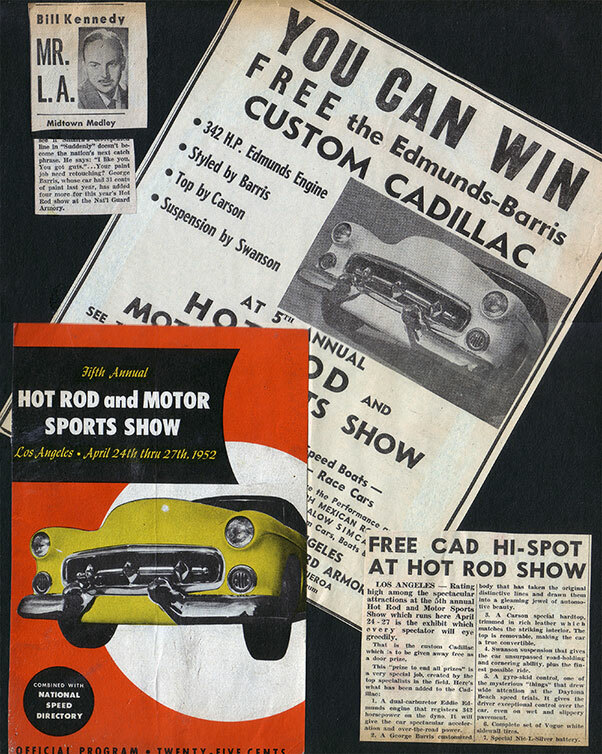 For the 5th Hot Rod Show, held in the Los Angeles National Guard Armory April 24-27, 1952 the show organizers decided their Annual Door Price Give Away Car, would be a wonderful custom car. 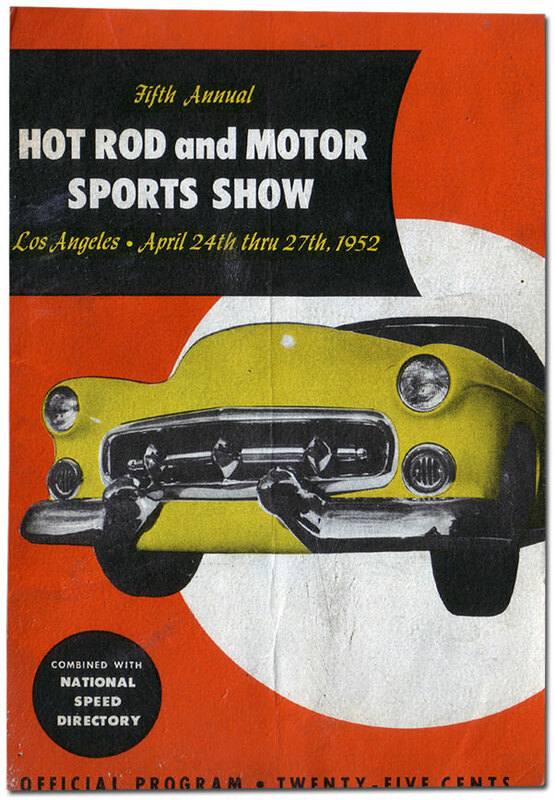 In previous years the show promoters had given away a 32 Ford Roadster, and some Sports Cars. For 1952 the Give Away Door Price was going to be a classy and unique custom car. Several manufactures were contacted to be part of the construction of this Custom. The Barris Shop was chosen to conduct the project, create the overall design, do the body work, and all other custom work needed. The Carson Top Shop was asked to do the car’s interior, and a removable padded top with wrap around rear windows. Eddie Edmunds was asked to hop up the engine and find the sponsors for all the needed hop up parts. 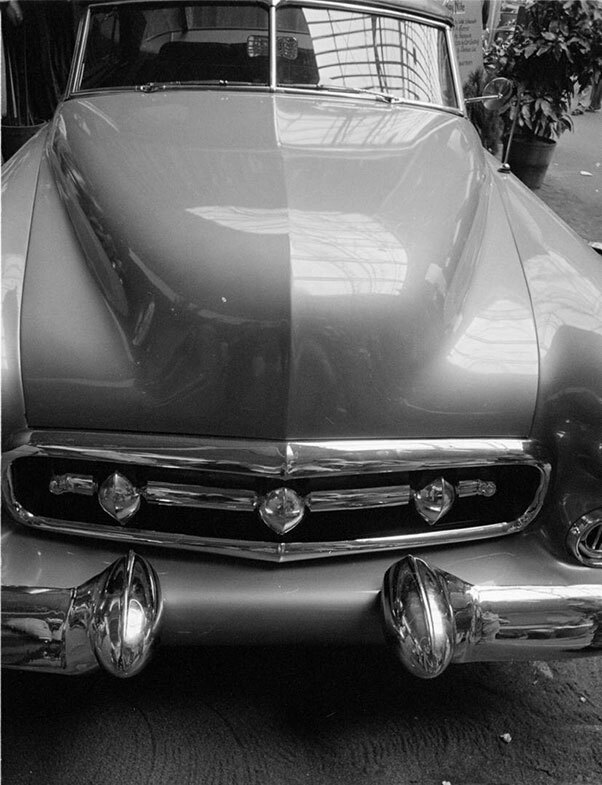 (Above) A rare photo of the freshly primed Cadillac was discovered in 2010 in the Barris Archives by Mad Fabricators’, Piero De Luca. The slightly worn photo shows that the car was completely assembled and driven while in primer. A common practice to find any problems before the car was going to be painted, and completely finished. 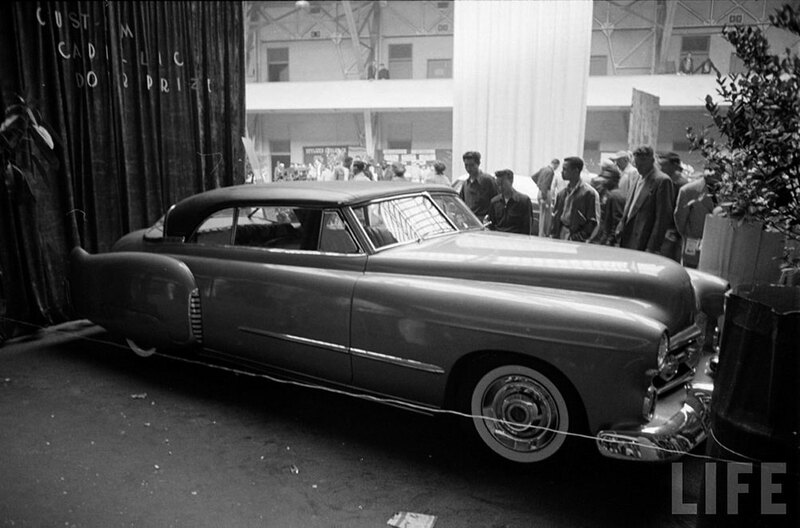 The show promoters delivered the 1949 Cadillac (barely a few years old by then) at the Barris Shop, early 1952. George Barris designed this custom to be an elegant, classy custom Cadillac. He knew the car was going to get a lot of publicity, so he did his utmost to make sure, this car was going to stand out as much as possible. One of the reasons the shops were willing to create a Give Away car was the free publicity. 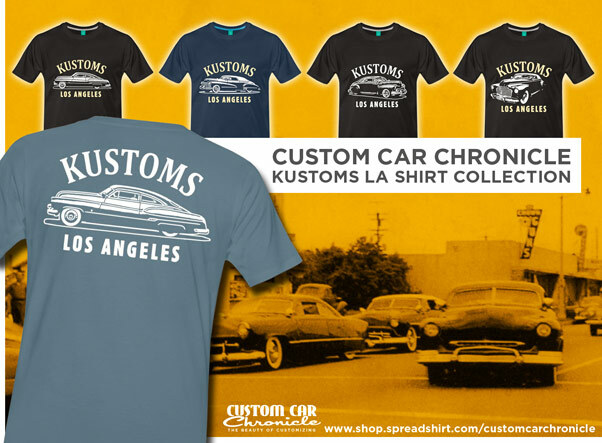 And Barris knew that the higher he aimed, the more Barris Customs became THE sought after kind of car, after the show. 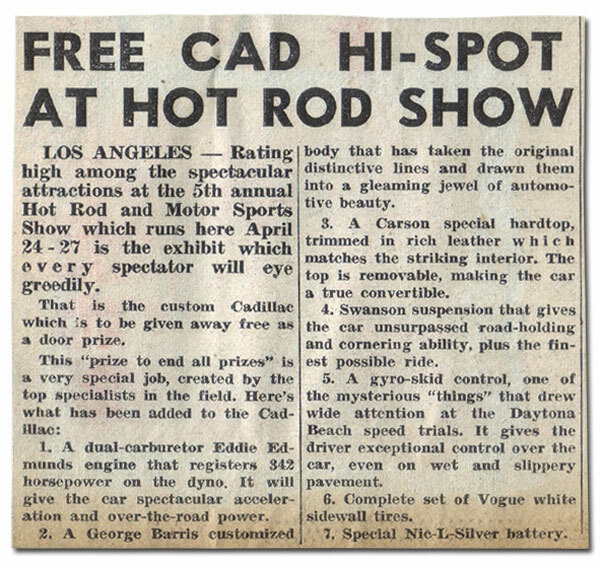 This announcement for the Give Away Caddy at the Hot Rod Show was made in the newspapers in Los Angeles. The car was still in primer when the photo for the announcement was made. The guys at the Barris shop started the project with the windshield, which was chopped 2,5 inches. George’s design asked for a new front end. And a new grille opening was created, using a second 1949 Caddy grille surround turned upside down, and welded to the original piece. This new one piece unit was smoothed, and send out to be chrome plated. The floating grille bar had ends made of 37 Chevy headlight buckets, and three grille teeth where used from a 1951 Ford Pick Up Truck set on a home made bar. The whole assembly was chrome plated, and installed slightly recessed in the new opening. A new front roll pan was created, and molded on to the front of the body. 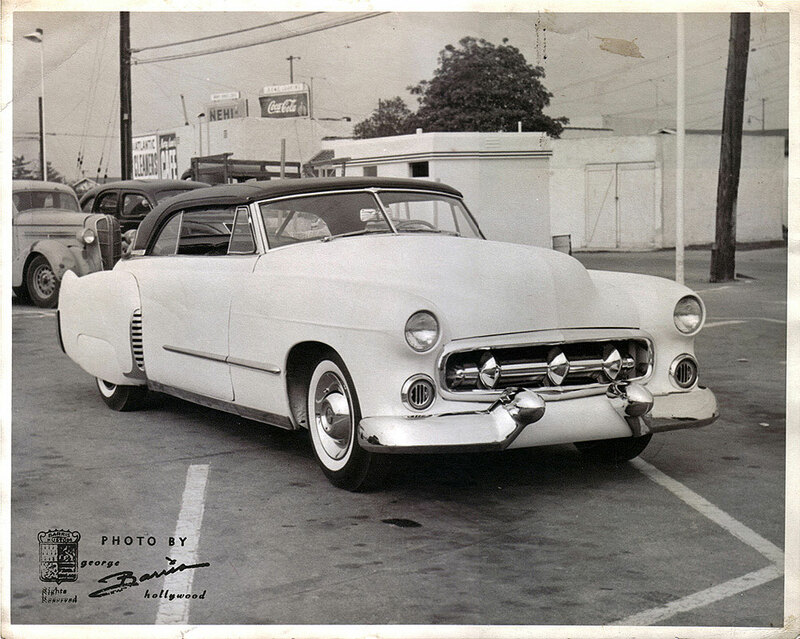 A 1951 Cadillac front bumper was used, to create the new split bumpers with integrated dagmars. The center section of the bumper became the custom created roll pan, and painted body color. 1951 Ford grille rings, and the custom made inserts where used for the air intakes below the frenched Caddy headlights. The hood had the emblem, and stainless removed, and was peaked in the process. The door, and trunk handles where removed, and electrical openers installed. A custom made rear fender air intake – to cool the rear brakes – was created using the rock shield of a 1949 Cadillac Fleetwood. The car was lowered, but not as much as many other Barris creations. Just enough to make the long Cadillac body look even longer. Swanson sponsored the project by supplying the needed components for the lowering job. When all the body work was done, the car was primed and assembled. Then it was time to deliver the Caddy to the Carson Top Shop, for a full custom interior in red and black leather. Carson also made a unique removable Hard Top with wrap around (Panoramic) rear window for the Cadillac. The top was not covered with white canvas, as most of the Carson tops were, but for this car they choose black leather as the cover material. When the Carson Top shop was ready with the upholstery part, the car was driven around for some time to find any flaws. Then everything was pulled apart again and Barris prepared it for a very classy pale gold paint job with extra gold powder. He named the color “Golden Fog” Unfortunately we have never been able to locate a color photo of this car, to show you how gorgeous it must have looked. 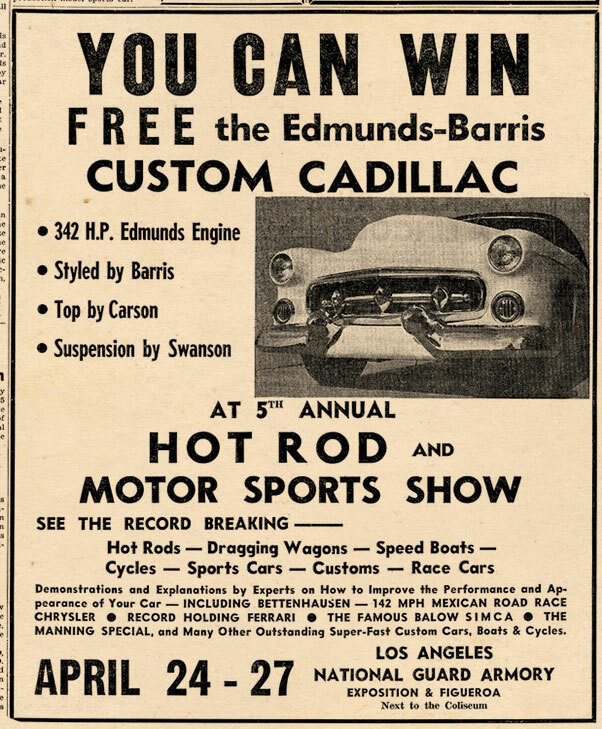 Some very interesting material that was also found in 2010 are some pages of a Barris scrapbook showing this Custom Cadillac. George kept scrapbooks from all the Barris Cars that made the magazines, show programs, posters etc. 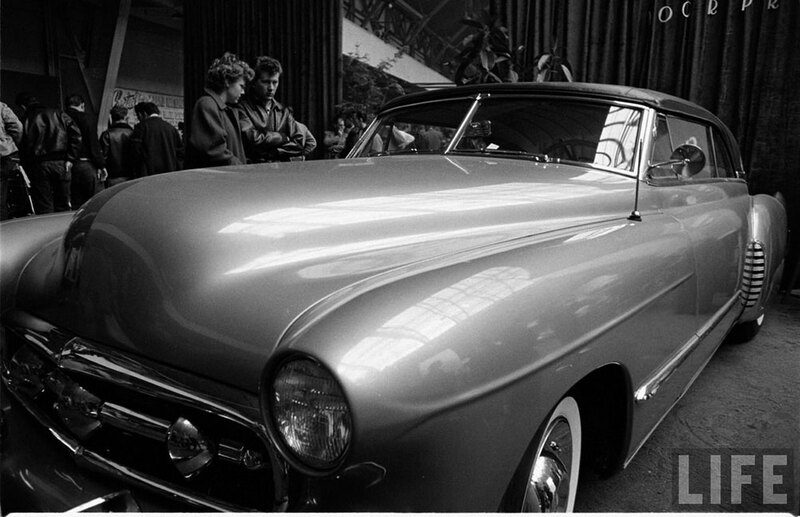 This unique photo of the car at the LA Hot Rod show in 1952 was made by photographer Loomis Dean for Life Magazine. It shows the custom grille and surround. And also the smooth Cadillac bumper ends. Another Life Magazine photo shows how long this custom is. The long hood and lowered top give the car excellent proportions. The Barris team have created a very elegant timeless custom for the show. The crowd stands beside the car, dreaming how wonderful it would be to win the door price, and drive away in it. 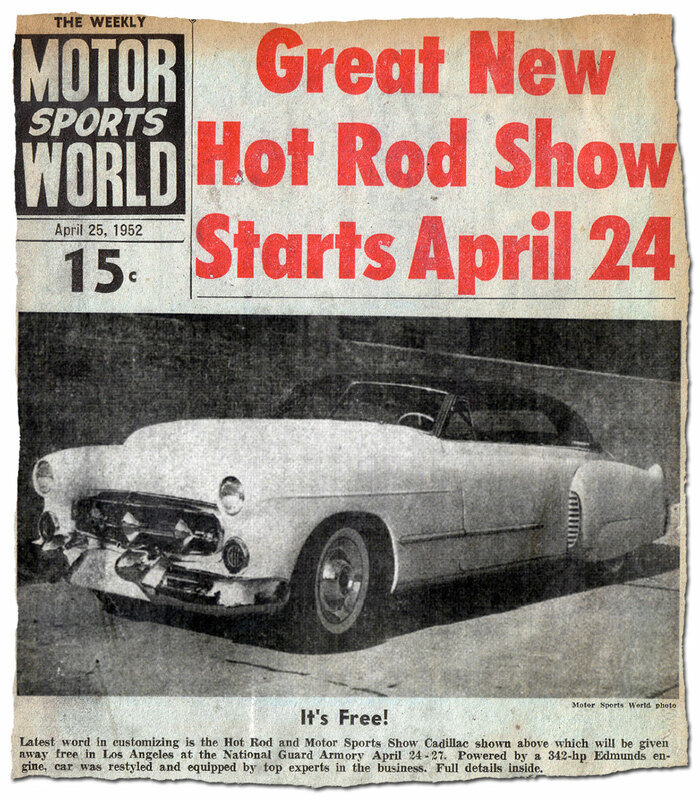 The car was featured in a three page article, in the December 1952 issue of Hop Up magazine. 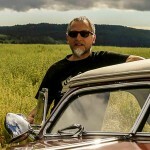 In this article there was no mention of of the new, lucky owner of the car. It seamed the new owner was not into showing the car at other shows, nor were he – and the car – part of any publicity after the show. 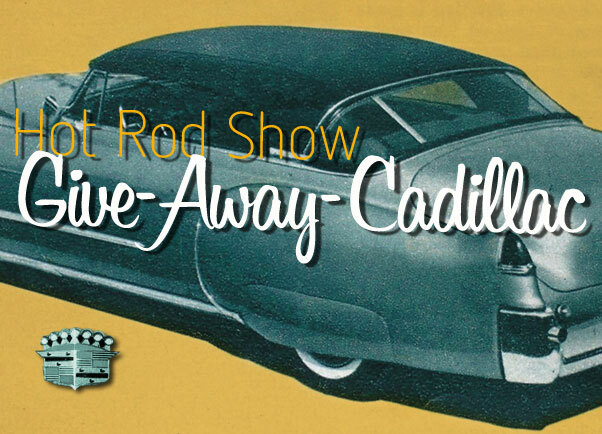 This Give away Cadillac received quite a bit of publicity before the 1952 Show. But after the show it disappeared. What happened to this car? 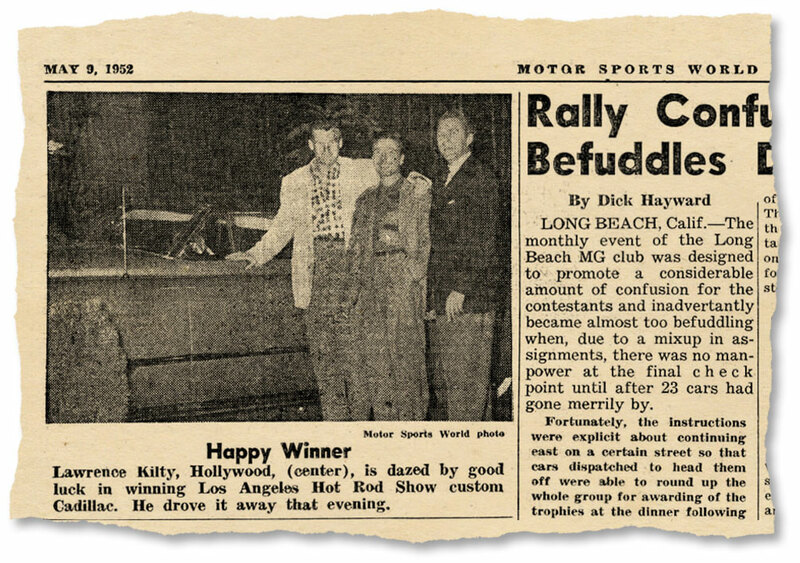 The only thing we where able to find out about the winner is a small article in the Motor Sports World News paper (below), when the winner Lawrence Kilty was congratulated with his price. Is this very nice custom still around? Does it still sit in a garage somewhere? What’s the story, what happened after the show? If you know more, please let us know. I attended this show when I was 11 years old. I remember the Cadillac very well, as it got a lot of press and it was very good looking to my young eyes. I never saw it again after the show, so I have no idea what became of it. Does anybody know what ever happened to this car ?